Mats Schilling is accountant and very thorough with numbers. Mats has been working since 2016 for Industrie-Contact as external accountant. Numbers are his passion. Only after all numbers are correct, he feels happy. 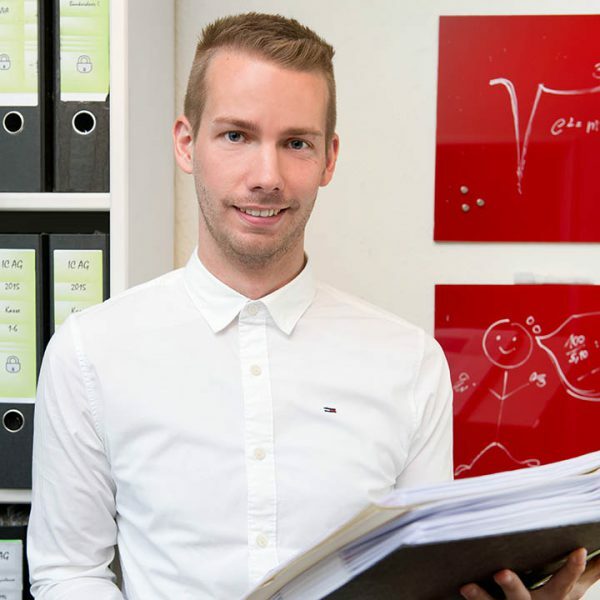 Mats works for the auditors and tax consultants DMP and takes care for IC as in-house accountant since 2016. In the meantime Mats has been very well integrated in the IC team. He is in charge of finance and accounting and prepares monthly economical evaluations. Mats is very interested in sports in the region of Hamburg. He regularly visits the home matches of the German Bundesliga football / soccer club Hamburger SV. He also supports the HSV Handball Division. But Mats is also an active sportsman. He plays football / soccer for the regional league club Oste/Oldendorf. His jersey carries the „6“, a famous number for all football addicts as world-class players like Schweinsteiger and Kroos have carried the same.